Steve Jobs and Bill Gates have not shared the same stage for 23 years. And tonight, at the Four Seasons Resort at Aviara they were together at the “special event” that directly followed dinner at the Wall Street Journal’s D: All Things Digital Conference. Sadly, we did not make it out. Thought we would, but didn’t feel like getting our “web worker” duds on and driving back out there again, even though, we’re guessing tonight is the big party. . . Click the link below for all the details on the evening. Blow, by blow, by blow. 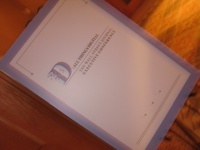 We didn’t get back up to the Wall Street Journal’s D: All Things Digital today. . . yet. But that didn’t stop Carlsbad from being the host to the most high-powered tech news on the planet. Nearly every story on technology that went up on the web today featured the words “Carlsbad, California” in them and that’s good for us, right? Here are a few of today’s top tech stories announced to the world for the first time at D.
The last thing you want to do is invest in the film business. The hedge fund guys want to, but they just want the producer credits and the girls. And there are cheaper ways of getting both. If we dive back into the mix tonight, we’ll let you know. Okay. It’s now 10:07 PM and we’ve just returned from the Four Seasons at Aviara where we successfully infiltrated the surprisingly intimate D: All Things Digital Wall Street Journal Executive Conference. On entering we walked straight into the D Anniversary Celebration and Nightcap Gathering (slipping past someone who looked like Six Apart’s Mena Trott) then took a right to go check out the conference rooms. The stairway in the back was lined with monitors and a woman was video taping something. Down below I saw a cadre of men in suits coming up the stairs from below and I was approaching to go down. Now, saying you’re going to go barge a conference, take some pictures and hang out is one thing. Doing it is another. We discovered this while standing face to face with the shockingly ghost-white John McCain who was surrounded by several aids and a team of Aviara’s finest security men. Before we could even think about getting our camera out they moved past and down the hall. We got no photo of John McCain, but we also didn’t get thrown out. Which is good. 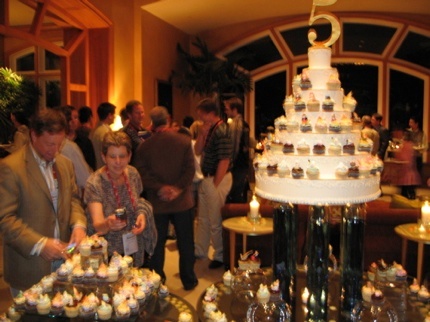 If we had, we never would have snagged this lovely photo of the 5th Anniversary cupcake tower. Having been to dozens of industry conferences we can add that barging is 100 times more fun than paying, wearing the lanyard and standing around with a bunch of geeks pretending to have a good time. Stay tuned: we’re making plans for another foray into the digital world tomorrow. Carlsbad has never been so tech. ADDED 10:50 PM: Just heard via Jason Calacanis’ Twitter post that George Lucas was in the lobby talking to Chad Hurley (Youtube.com co-founder) and it is obvious that we left too early. We just took a stroll past Vigilucci’s overlooking Tamarack surfing beach and saw some guys in suits getting into a taxi headed back to Aviara. 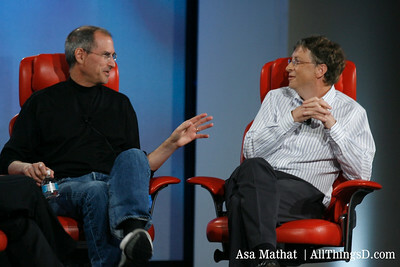 They looked very “tech,” but they weren’t Bill Gates nor Steve Jobs. And seriously, we’re thinking about driving up there to see if we can mingle with the technorati of the world. Only 500 people get to attend. Obviously, we’re not any of them. We’ll be seeing some big announcements from Palm and RealNetworks, the debut of Mahalo, unscripted conversations with a host of tech luminaries and, of course, a few surprises. 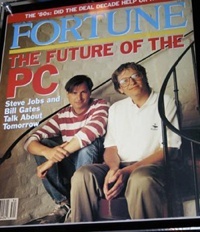 Plus a rare joint appearance by Apple CEO Steve Jobs and Microsoft Chairman Bill Gates. With exciting prose like that it’s no wonder he’s the Wall Street Journal’s blogger of choice. If we make it up there, we’ll report back. Hopefully, it won’t involve Four Seasons security and a night in the at the Vista jail. P.S. Here is the schedule of events for the next three days, if you want to join us in a tech barge. 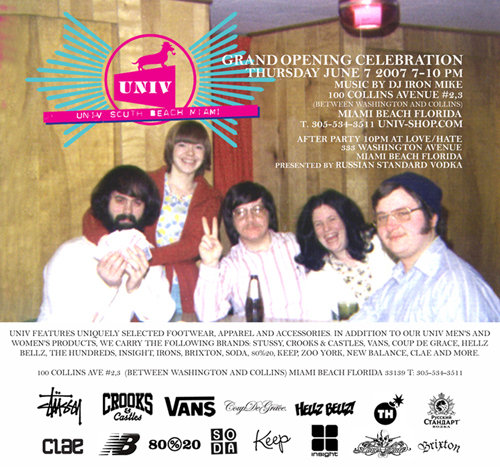 Univ style shop co-founder and long time Carlsbad resident (we love that tag) Tim Swart is happy to announce the grand opening of The UNIV Select Shop in South Beach, Miami, Florida on Thursday June 7, 2007. The UNIV Select Shop features UNIV apparel and other key brands, from footwear, apparel and accessories, for men and women. The UNIV Select Shop interior is an eclectic tribute to old Florida, a time gone by, with additional curiosities thrown in. The shop is a collective between UNIV partners Mirko Mangum and Tim Swart, longtime Miami resident Mark Gamez and entertainer Sal Masekela. Miami is no Carlsbad, but then neither is Encinitas. Let’s just say if we were there, we’d be there for sure. LA Lakers owner Jerry Buss, 74, of Playa del Rey, California was arrested early this morning (1 AM) driving his gold Mercedes the wrong way on Mountain View Drive near the Carlsbad Army and Navy Academy. The arresting officer said Buss was booked into the Vista jail on suspicion of drunken driving and driving with a blood alcohol content of 0.08 or above. Shortly after noon Buss issued an e-mailed statement through a Lakers’ spokesman. “Although I was driving only a short distance, it was a bad decision and I was wrong to do it,” Buss said in the statement. “It was a mistake I will not make again. . . . Buss had been released from the jail by 10:30 a .m. today, according to the San Diego County Sheriff’s Department web site. 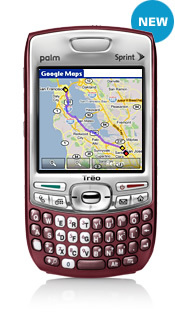 Jeff Hawkins, founder of Palm, Inc., will announce a new mobile device tomorrow [May 30, 2007]. The device is founded on what Palm is calling a third “new” category of mobile device. We’re seriously going to have to sneak into this thing. Anyone know any bellmen at Aviara who would loan us a uniform? Invitrogen Corporation and Clontech Laboratories, Inc. have jointly announced a confidential settlement of their patent litigation, following a jury decision last week in federal district court in Greenbelt, Maryland. As part of the settlement, Clontech has agreed that Invitrogen Patent Nos. 5,244,797, 5,668,005, 6,063,608, and 5,405,776 on RNase H minus reverse transcriptase (RT) are valid and enforceable. Clontech has discontinued sales of its RNase H minus RT products, including its PowerScript products, for the life of the patents. The parties did not disclose other details of their agreement. We’re sure there are quite a few Invitrogen employee who will be sleeping better tonight, in their Carlsbad beds. At last year’s Olympics, the all-American, apple-pie star was not the skier (Bode Miller, who wound up being an embarrassment on the slopes) but the snowboarder (mop-topped Shaun White, who’s so wholesome that he’s a Target spokesman). It’s hard to imagine a theme-park ride named after Jose Canseco. But there is now one in honor of skateboarding icon Tony Hawk: In March, a Great Adventure in Texas became of the first of that chain to feature a Hawk rollercoaster ride. with an interview with Sen. John McCain, who is in the race to become the Republican nominee for president of the United States. We will talk to him about that, as well as the war in Iraq, but also hope to discuss a plethora of digital issues with him. Others who will be speaking includes: Microsoft CEO Steve Ballmer; CBS CEO Les Moonves; News Corp. President Peter Chernin; Cisco CEO John Chambers; former AOL CEO Steve Case, who will talk about his new company, Revolution; famed director and producer George Lucas; Time Inc. CEO Ann Moore (don’t really know what she’s doing at a digital conference); Google CEO Eric Schmidt; YouTube founders Steve Chen and Chad Hurley; Philippe Dauman, CEO of Viacom; and space tourist (and former Microsoft exec) Charles Simonyi. This is probably Carlsbad’s biggest name crowd ever.